Ahh shakshuka! An amazing Middle Eastern breakfast dish that is as fun to say as it is delicious to eat. 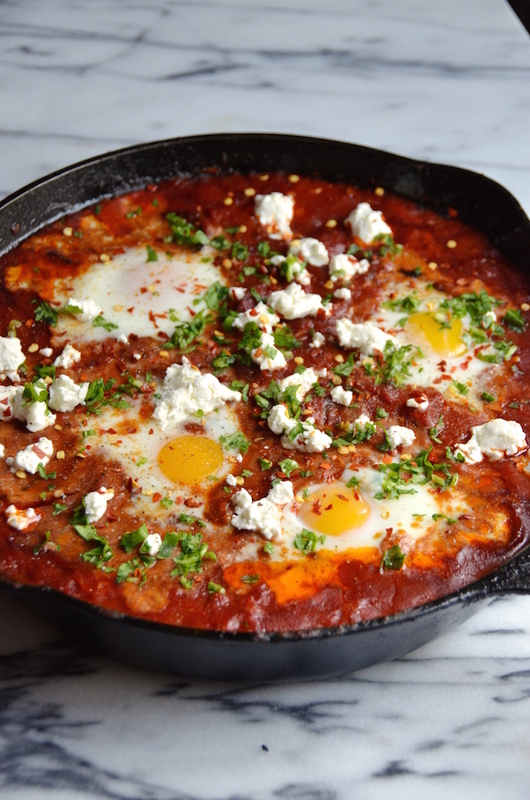 At its most basic, shakshuka is a dish of eggs baked in a savory tomato and pepper sauce spiced with paprika and cumin. But honestly, that's just the beginning. Add in sauteed veggies, cheese, or meat (or all the above) or have a little fun with the spices. It's a simple and cozy dish that works well for both breakfast and easy dinners. It's wonderful if you're feeding a crowd because the sauce can be made well in advance with just the eggs and final baking done right before serving. Shakshuka is a favorite brunch dish up at the retreat center where I cook in Vermont a few times a year. The totally vegetarian dish is perfect for feeding groups of folks with a variety of dietary restrictions. I've always enjoyed it, but it wasn't until I tasted a spicy chorizo version at a small cafe in my neighborhood that I fell hard for it. And (of course) decided to recreate for you! This dish comes together very quickly and uses up super basic ingredients that you may already have: an onion, a bell pepper, some garlic, a can of tomatoes and basic spices. I always have chorizo in my fridge (I'm obsessed) and eggs. I recommend a spicy Spanish-style chorizo that you can slice and sauté along with your onions. The whole thing takes less than 40 minutes to make, and you can easily adjust the servings just by adding more eggs. Top with crumbled cheese and a sprinkle of fresh herbs, then serve with a big tangy salad and some crusty bread for a perfect meal at any time of day. Or anyone of these 25 Awesome Breakfast Recipes! Preheat oven to 375 degrees. 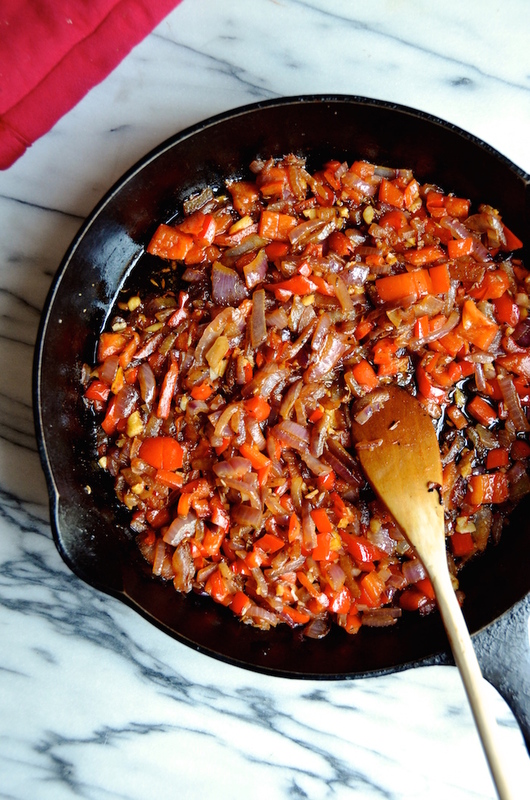 Place a heavy 10" oven-safe skillet (such as cast iron) over medium-high heat. Add the oil and chorizo and cook until chorizo is slightly crisped. Add the onions and peppers and saute five minutes, or until tender. Add the garlic and cook 2 more minutes. Add the tomatoes, smoked paprika, cumin, chile flakes, and season with salt and black pepper. Stir well, then lower heat and let simmer 10-15 minutes or until slightly thickened. Transfer to the oven and let cook 7-10 minutes, or until the egg whites are fully cooked and the yolks are just set. Remove from the oven and garnish with cheese and minced parsley.